Pakistani director Sabiha Sumar's brave new documentary, Azmaish, looks at retreats from liberal democracy on both sides of the border. 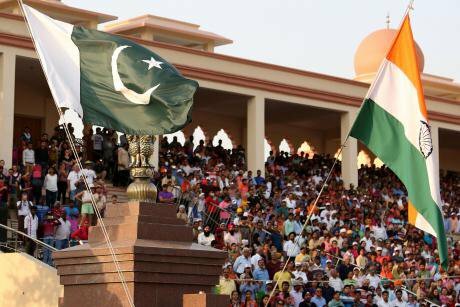 Pakistani and Indian national flags. Photo: Xinhua/SIPA USA/PA Images. All rights reserved.It’s a curious phenomenon: the further Indian independence from Britain recedes into the past, the more attention it receives. It’s as if the British psyche is in greater need of past glories amidst Brexit. The 70th anniversary of Indian independence this year appears to have attracted more attention in the British media than even the 50th. This month’s London Film Festival also nods in this direction with its screening of Azmaish: A Journey Through the Subcontinent, billed as “a rare and incisive female-centric documentary”. The director, Sabiha Sumar, was born in Pakistan to parents who had migrated from India during partition in 1947. Her film sets out to address the daunting questions: “which direction is Pakistan heading in?” and “how do I, as a modern woman, fit into this society?” Recognising that these questions cannot be answered in isolation, when India and Pakistan are cut from the same cloth, Sumar recruits a fine Bollywood actor, Kalki Koechlin, to front the Indian portion of the film’s journey. This stereophonic strategy is refreshing as we are used to a more partial approach. Indian feminist Urvashi Butalia reminds us in her book The Other Side of Silence that there is a necessary one-sidedness to partition stories because researchers from both countries are hamstrung by the “baggage of bitterness”. Up to two million people died and 10-12 million were displaced during partition. Hostility continues and travel between the two countries isn’t easy. Besides, crossing the subcontinent is an ambitious undertaking: this is a region like the European Union, not a country. A still from the film Azmaish: A Journey Through the Subcontinent.Azmaish (which means "trials of life") is an impressionistic, gentle film that reflects Sumar’s politically astute and secular sensibility. It begins with an internal conversation with her deceased father, who also had a secular outlook. So how would he justify the creation of, and migration to, a country on the basis of religion? Sumar notes her father’s original hope for Pakistan – that it would be a society with equal rights for all, not just for Muslims – and his fears that India could not safeguard the rights of Muslims, despite the promises of Jawaharlal Nehru (India’s first prime minister). India’s turn to Hindu nationalism since the 2014 election of current prime minister Narendra Modi, of the Bharatiya Janata Party (BJP) appears to vindicate such fears. One interview in Sumar's film, with Vijay Kant Chauhan of the Mother Goddess of India Trust, reveals all that is frightening in the Hindutva ideology that has gripped the nation. Chauhan appears to spend most of his time burying stray cows out of respect for the Mother of India, or protecting young women from the attentions of Muslim men. The Bollywood actor, Koechlin, conducts the interview with Chauhan and despite her training is unable to disguise the alarmed expression on her face. She’s an interesting choice for this film; she was born to French parents in Pondicherry although she identifies as Indian and speaks Hindi fluently. The Hindu fanatics who question the right of Muslims to identify as Indian do not question her identity. When I interviewed Sumar this summer, she argued that “in times of economic insecurity, answers have to be found. In South Asian cultures, we look to religion during times of hardship.” In the film, she ponders the conundrum that if the rise of Hindutva is a populist reaction against India’s westernised, secular elites, and their neo-liberal policies, why does big business support Modi’s government? An unnamed student activist from Delhi does a good job at trying to answer this question. People may blame rising unemployment and inequality on a growing population – with the solution ‘let’s send Muslims to Pakistan’. Though capital isn’t being invested in production and job creation, but rather in the stock market “casino”. So finance capitalists are grateful to the BJP and its anti-Muslim agenda for distracting the public from the true cause of their poverty. When we talked, Sumar said that India had been a role model for Pakistanis like herself, and “when India turns away from the secular, it comes as a big shock for us.” In the film, she says “Pakistan has created an enemy within – a strong brand of Islam in the form of the Taliban which challenges the state itself” and asks: “is this something India could learn from?” It’s clear that she feels India is heading in the same, worrying direction. 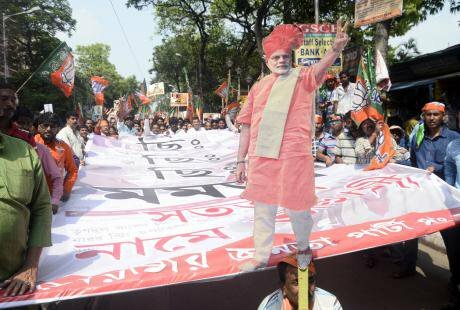 A cut-out of Indian Prime Minister Narendra Modi at a rally in Kolkata. Photo: Saikat Paul/Zuma Press/PA Images. All rights reserved.What doesn’t come across in the film is the unprecedented culture of fear that is spreading across India, with many reluctant to openly criticise the government. A head teacher in southern India, who spoke to me on condition of anonymity, said “retribution from the government depends on the socio-economic status of the critic”. They described the activities of the ABVP, a right wing Hindu student organisation, which enters university lecture halls and sends women in western dress home. The founder of NDTV, one of the few television channels to criticise the BJP, has been hit with a financial fraud charge which some see as an attack on press freedom. The recent killing of an outspoken woman journalist, Gauri Lankesh from Bangalore, is one of several unexplained deaths. Cow vigilante groups have attacked and killed poor Muslims on suspicion of eating beef, and have faced no criminal charges. Gender inequality is a pervasive but understated issue in the documentary – as if it is a breeze blowing through the film. It’s there in the clothes that Sumar and Koechlin wear depending on who they interview: heads covered in scarves in rural areas, or in the presence of conservative men; western clothes in the city. It’s reflected in the total absence of women in the mansion of a feudal landlord in Pakistan, who says casually that they will not appear in public. I would have liked gender to have been more in the foreground. Whilst taking refuge in religion might be the consequence of neoliberal policies, the impact is felt mostly by women. The film doesn’t directly answer its opening question about the place of a ‘modern’ woman in this society; it only hints at answers. Sumar puts on a persona in the places where she doesn’t belong. I would have liked a clearer sense of whether public space in Pakistan – which identifies as an Islamic nation, with sharia rule discriminating heavily against women – is more closed off to women than India. Again there are hints of this; in crowd scenes, for instance, Pakistani streets appear more male-dominated, whilst in India they seem more gender-balanced. Azmaish: A Journey Through the Subcontinent is at the BFI London Film Festival, 5 & 6 October.